(2017). "PRO-STAT® Max". In (Eds.) , WoundReference. Available from: https://woundreference.com/app/topic?id=pro-stat-max. Retrieved on 4/25/19. Pro-Stat 64 liquid protein formula is an enzyme - hydrolyzed concentrated protein fortified with L-tryptophan. Per serving, Pro-Stat 64 has 15 grams of protein and 72 k/cal per 30 ml (one ounce) and is sugar free. 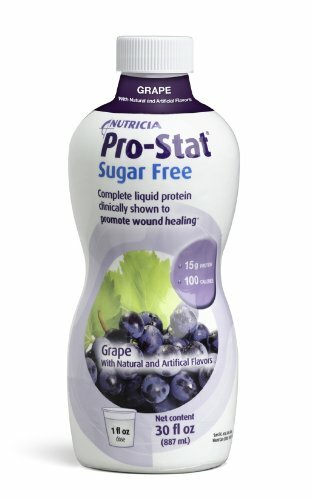 Pro-Stat 64 is rich in Arginine, Glycine, Proline and Hydroxyproline, with high nitrogen donor capability to accelerate tissue healing, a critical factor in replenishing depleted protein stores in patients with pressure ulcers, malnutrition, and low albumin levels. Clinically proven to have a 96% greater healing rate for pressure ulcers.